Complete Paytm Mini KYC Without Aadhar Card, How ? - FreeServiceHindi.com - Free Services in Hindi. Technology Complete Paytm Mini KYC Without Aadhar Card, How ? Complete Paytm Mini KYC Without Aadhar Card, How ? Paytm Mini KYC: Hope you are enjoying our Free Services. As we know To Avail any Cashback Offer by Paytm we must have to Complete the KYC Process, Wether it is Full KYC or Paytm Mini KYC. So Today We are going to Share a Trick to Complete Your Paytm Mini Kyc to Receive the Pending Cashback. 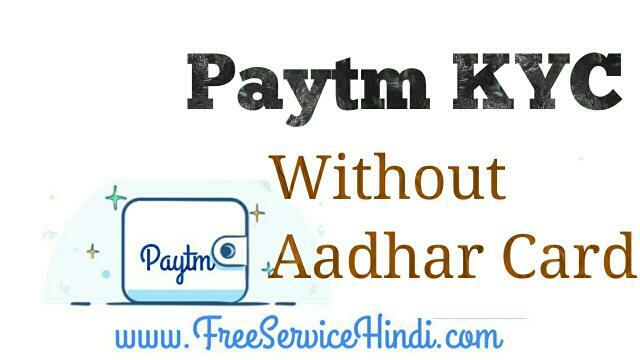 By using this Method you can Complete your Paytm Mini KYC Without any Aadhar Card, Online by Sitting at your home. Yes You heard it Right !! By using the below Mini Kyc Paytm Process you can Complete your mini kyc by any Government id proof..
As we know that According to the rule of RBI from 31st March, Every Wallet Users have to Complete their KYC (Know Your Customer) Process. Without Completing the KYC, We can not use any Wallet. 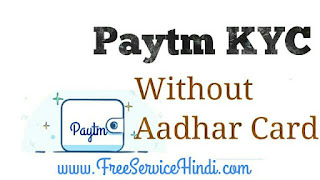 How To Complete Paytm Mini KYC without Aadhar Card ? Firstly you have to Visit Paytm Mini KYC Page, by Clicking Here. Login by entering Your Non-KYC Paytm Registered Number. Now it will Send you the OTP , Enter that & Verify. Now Click on "I Don't have Aadhar". After that you will See Options Like Complete your Paytm Mini KYC With Voter id Card, PanCard, Narega Job Card etc..
Now Choose Government Id Proof Option, Which you have. Enter your Government id Number, And Click on Submit. Once you Click on Submit, you will get a Message that "Congratulations !! You have Completed your "Paytm Mini KYC". Now You are Eligible to Receive the Cashback from Paytm". After Completing your Paytm Mini KYC, You are Eligible to Get Cashback from Paytm for Shopping, Recharge and other thing. But You can not Transfer these Cashback Amount to Other Paytm Wallet User, It Can be Paid To Paytm Agents or to the Shop where Paytm is Accepted. I hope by using the Above Process, you have Completed your Paytm Minimum KYC Without any Aadhar Card, Online by Sitting Your Home. And got your queries solved about how to complete mini kyc in paytm. If Still having any questions or queries regarding Paytm Mini KYC then you may ask in Comment.